I like to think I'm a growing being, ever changing, developing, learning, and eager to face new challenges. I seek new and better ways to do things. If I see a flaw in my current methods, I work to change and improve those methods. Now, I do see a flaw in how I'm allocating my time for this blog. I have been focusing too much on producing frequent posts, and shortchanging the quality of my posts. So, for the next little while, I'll be reducing my posting schedule to 3 days per week. I am hoping this will give me the time I want, to do a job well, so that you, dear friend, can have something truly worthwhile to read when you visit. I'll continue to stick with a schedule. You can count on a post being available Tuesday, Thursday and Saturday in the early morning hours. If for some reason, you come to creative savv and don't see a post on one of those days of the week, you can know that either I'm ill, there's been some sort of emergency in our home, or I'm having a senior moment and I thought I hit the "publish" button, but I didn't. And my deepest apologies for scenario number 3. That day will come, when senior moments occur with greater frequency. I'm just hoping I've got a long way to go until then! But for today, here's my regular post. I have this incredible knack for producing unset jellies, jams and now marmalades. I thought I'd conquered this with the jams and jellies. Not an unset batch this past autumn. But evidently, my marmalade is another story. I do know why this keeps happening. I am so afraid of developing a scorched flavor in these preserves, that I tend to err on the side of undercooked. 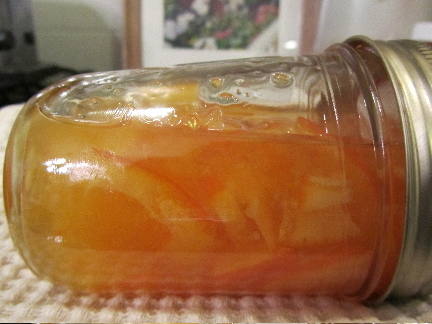 I made my once-a-year batch of marmalade a week ago. It came out kind of syrupy, and not at all jelled. Fortunately, I've got a lot of experience in re-cooking jams and jellies. So, yesterday afternoon I set out to re-cook my marmalade. I went online to make sure I was re-cooking marmalade correctly (in case there's any difference between re-cooking jelly and re-cooking marmalade). I found these instructions from ehow.com. It's very simple, but it does take added pectin. I stirred the pectin and sugar together in a small bowl, to break up any lumps of pectin. Then I mixed these in with the water and lemon juice, right in my jelly pot. Next I stirred in the unset marmalade, until completely combined. Stirring constantly, I brought this mixture to a boil. I could feel some build-up on the bottom of the pot, so continued stirring. I boiled, while stirring, for 1 full minute. I filled my sterilized jars, added new lids, and reprocessed. So far it looks like this worked. I had a small amount of marmalade leftover, which I put in a dish on the counter, and it is thickening up nicely. I'm hoping that your marmalade is more successful on the first run than mine. But just in case, I can (sadly) vouch that these instructions work for re-cooking a runny batch. You didn't make marmalade. You made ice cream topping. you're totally right. What I made was more akin to a syrup than a spread. It would have also made a great pancake syrup. My mom used to make crepes and put an orange topping on them. This would be perfect for those! I never knew your posts were lacking in quality--I've always enjoyed them. :) I am also a big fan of doing a few things well rather than trying to cram a lot of things in without regard to quality so I understand your desire to focus on fewer posts. I like the days you are choosing to post--so many people seem to do a Monday/Wednesday/Friday schedule. Looking forward to what you have to share with us. oh, big congratulations of the knitting! Good luck with your project. The great thing (and by great, I mean frugal) about knitting, is you can use up every last little bit of yarn. That's a little difficult with fabric and sewing, sometimes. I always seem to have scraps to deal with after a sewing project. I know, there's always patchwork. But I do think it's easier to be frugal with leftover yarn, than leftover fabric. I think I'll enjoy a Tuesday, Thursday and Saturday schedule. It will fit well with some of the other things I do. Thanks for your vote of confidence! I will be interested to see your new posts. I think the quality of the ones you do now are quite good. Do you plan to change or narrow the content? I think I just want to focus on better writing. Some people communicate well through speech and others through writing. My in-person skills are not all that great, so I figure I might as well work on my writing skills. I know that probably sounds backwards. That I should be focusing on developing better verbal communication. I'll do that another year. For this year, my goal is to become a better writer, not a prolific writer. And I hope that anyone who visits here, finds greater enjoyment in what I've written. As far as change in content, it will only change as I grow as a person. If it doesn't change at all, uh oh, that could be a bad sign about me personally! so what you made was grape juice concentrate! You didn't per chance, begin with concentrated grape juice, did you? I've seen those recipes. What did you wind up doing with the very sweet grape juice? I know we're not alone in making unset jellies and jams. How is it that recipes for these items fail so often, for so many folks? You clearly are more of a perfectionist than I am. I would have stuck with the syrup and used it that way then tried again next year :-) At least I know if I make this myself there is a way to correct it if I choose, thanks for the information. My problem is that I really wanted marmalade. And I'm just too cheap (um, I mean frugal) to buy any! Yes I'd stick to the runny syruppy marmalade for myself but I give away quite a bit, and I think others might find it tooo messy! Well, at least you have managed a method for consumption, so as not to waste any! Well that's very very strange...my marmalade turned out runny too! But I didn't worry because I thought to myself, "Lili will know what to do!" and you did! I had a feeling it would be something to do with adding more pectin...As for 3 posts a week, I think that's a very good number to post :-) I aim for that but can't organise myself to stick to a routine, or claim that the quality is better as a result!! I think runny jams, jellies and marmalades are more common than we know! Just nobody wants to own up to it!!! If you do re-cook yours, see if it doesn't firm even more over a few days after cooking and putting into jars. I don't know if this happens for you, but I can make jelly and not know if it has turned out for up to 10-14 post cooking. I waited about 10 days with this marmalade. Then after re-cooking, it seemed like it was sort of setting, and then this morning, even more so, although still not firm like jelly. I'll see what it looks like in a day or two, to know for sure. Pour-able marmalade is what we've created. A new labor saving twist, far superior to the old-fashioned, have to use (and dirty) a knife or spoon, marmalade of days past. New and improved! 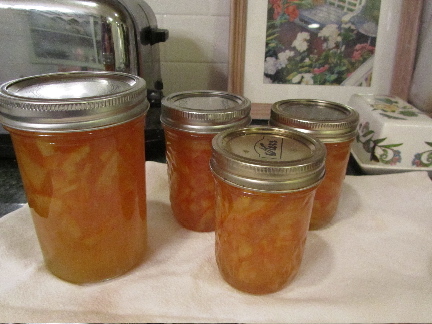 It's reassuring to hear that other's marmalade has also turned out runnier than the store bought versions. I have made runny marmalade too! I re-cooked it with more pectin. Now I'm beginning to think that there is some mystery ingredient that the factories use to make their marmalade thick, and I shudder to think what it could be! I'm encouraged to know that yours was re-cooked to your satisfaction with added pectin. There's hope for mine, as well.